Together, DP's three amp simulator plug-ins cover a lot of sonic ground. 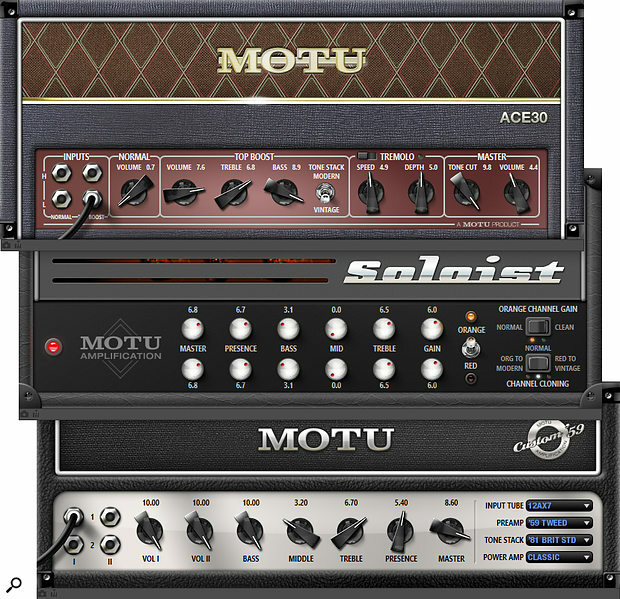 From shred to salsa, Digital Performer's amp modelling tools can cater for any guitar style. One of the biggest developments in Digital Performer 8 was the addition of a new suite of plug-ins targeting guitar and bass players. DP9 took this even further, adding synth guitar-type capabilities and multiband distortion. In this workshop, we'll look at how to get the best from the three amp simulators introduced in DP8. Note that the amp plug-ins themselves don't include cabinets — you'll need to use one of the rooms described later, and choose the desired cabinet and miking, to assemble a final guitar sound. Both individually and together, the three amps cover the main guitar amp domains of clean, crunch and distorted. As the name suggests, ACE30 emulates the Vox AC30 family, offering Normal and Top Boost channels each with high- and low-level inputs. You can also choose from 'vintage' or 'modern' Tone Stack circuits. Vintage gives the Gibson tone stack sound, which Vox copied from the Gibson GA‑70/GA‑77 schematics for their mid-'60s amps, while the modern option is more like the Fender tone stack. ACE30 also boasts the famous 'tone cut' control that confused people because turning it clockwise made the sound duller. 2 weeks 14 hours ago.